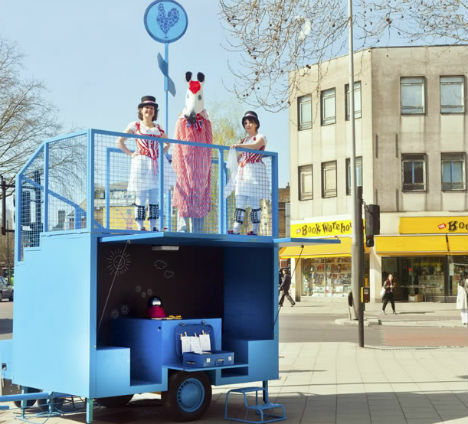 Based on the stalls of performance artists and fortune tellers that once wandered the streets of Europe in the sixteenth century, ‘Roaming Market’ brings fun little shows to London in modernized form. Local studio Aberrant Architecture constructed the steel venue on a trailer chassis so it can be moved from one urban location to the next in the Waterloo district this summer. 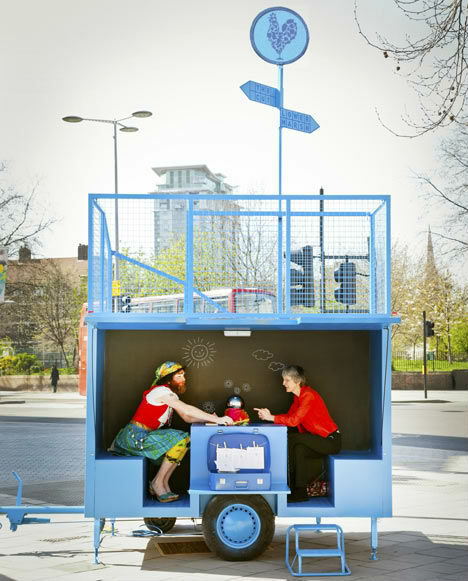 Painted bright blue and bearing little ornamentation, the stall only vaguely resembles the often-ornate ‘pageant wagons‘ of centuries past, but it serves the same purpose: livening up the streets with music and plays. Pageant wagons were movable carts on which plays based on biblical texts were performed, before the rise of professional theater rendered them obsolete. 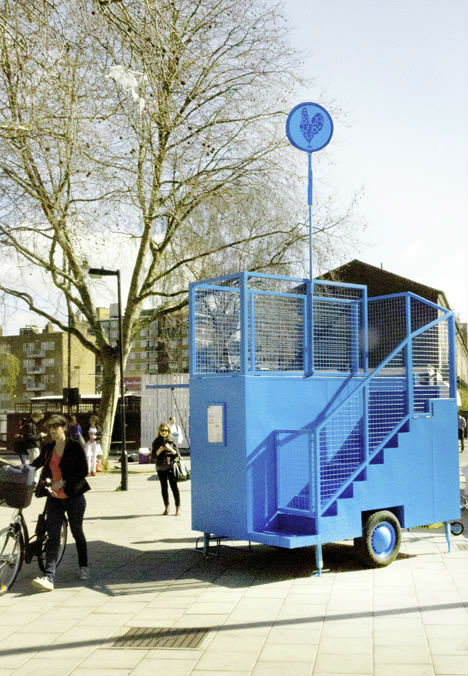 The mobile venue is also inspired by the ‘totem’ structures found in London’s historic street markets. It unfolds into a multi-functional stall with a covered seating area featuring a built-in chess board, as well as a rooftop stage. The giant chicken sign protruding from the top is a nod to the history of chicness being used to tell people’s fortunes. Waterloo is an ideal location for a revival of the tradition, with its long history of fortune tellers, mystics and peep shows. Roaming Market will be used to promote Waterloo as a vibrant shopping destination, and will ultimately be moved around the wider area to act as a signpost for the historic Lower Marsh Market.